With a unique approach, LabX allows you to work from either the instrument or PC or both. Either start your analysis at the instrument or from the PC and always have access to your current sample analysis and latest results at the same time. Whether you are on the go or currently not located next to your titrator or LabX network, use LabX Mail to get messages or results sent to you. Increase your efficiency by getting tailored messages: e.g. “Results out of specifications” or “Ready for more samples”. Fully automate the selection of the correct method and transcription of samples IDs with a barcode or SmartSample RFID tag. Thus, eliminate sample order errors by reading the sample information as you test it, as well as ensuring the right method is selected for each product. Use the automated 1D and 2D barcode reader with InMotion™ Autosamplers. 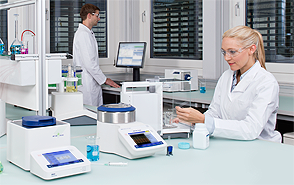 Excellence Balances connected to LabX have a dedicated entry point for titration tasks that require weighing. Simply pick the task and the balance will guide you through the samples. 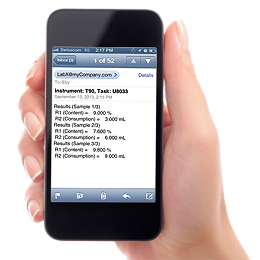 Start your titration and add more sample weights as you‘re testing for improved productivity. 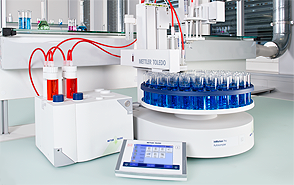 Connect titrators, balances, density meters, refractometers, and melting point instruments all with one single software. Gain ultimate productivity with the new InMotion Autosamplers. 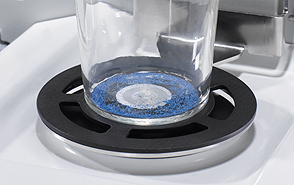 Use SmartSample™ RFID weighing with Analytical Excellence balances for ultimate security and efficiency in weighing.